We all love a good meal, coming home from the gym after a long day at work, you are likely looking forward to having a relaxing evening with a healthy hearty meal. A kind of meal that makes you feel warm and reminds you of your youth when your parents would cook your all time favourite. We have decided to spruce up those hearty meals and make them healthy so you can still enjoy those incredible flavours of your favourite foods. Preheat the oven to 425ºF or 220ºC. Put the diced sweet potatoes on a sheet pan and the broccoli on another. Drizzle some olive oil over both of them and top the sweet potatoes with salt, pepper and cumin. Add some salt and pepper to the broccoli and toss them both. Bake the sweet potatoes for 15 minutes and put the broccoli to one side. As the sweet potatoes are baking, prepare the salmon. In a small bowl, combine butter, lemon juice, garlic powder, pepper flakes, thyme, salt and pepper. Heat it all in the microwave for 15 seconds or until the butter melts. Line a small baking sheet with foil, and spray with cooking spray. Place the salmon filets on top. Drizzle with the prepared lemon sauce. When the potatoes have been in the oven for 15 minutes remove and toss them. Now place them back in the oven along with the broccolini and salmon for 12-15 minutes. 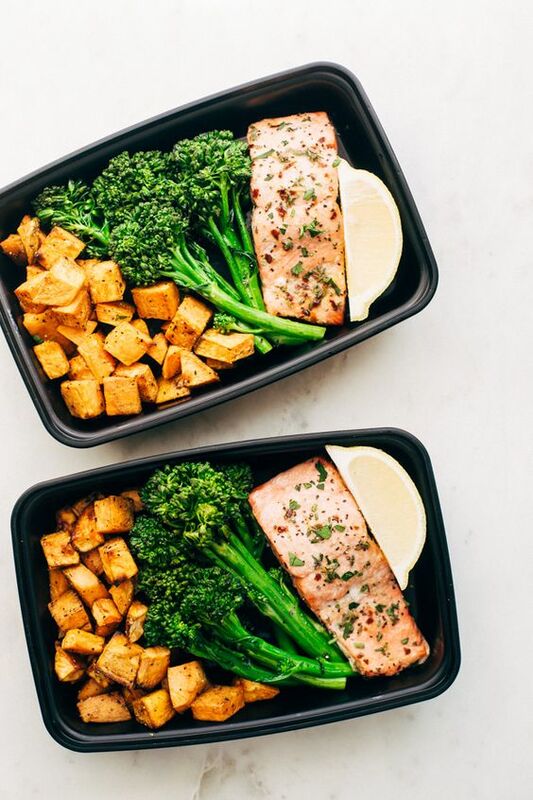 Check on the salmon and broccolini around the 8-minute mark. Baking time will vary depending on the thickness of the filet.